SOMETIMES I FLY… - LIVE IN BREMEN 2001”, the 23rd. album of Luka Bloom. The usual high standard, expected of this Irih singer/songwriter. This time recorded live at Radio Bremen in Germany on 2nd December 2001. The original tapes were edited and mastered by the artist himself together with Brian Masterson at the Soundscape in Dublin/Ireland. It was an excellent concert that night in Bremen nearly 17 years ago. The sound is brilliant and clear. Luka Bloom is a great entertainer and artist, giving the fans what they want with pure sounding vocals and lovely guitar. Every tune is catchy with an easily visualized and felt story based on deeply reflective lyrics using a seemingly limitless musical vocabulary. This album is an uplifting journey of track after track after track that you want to listen to. 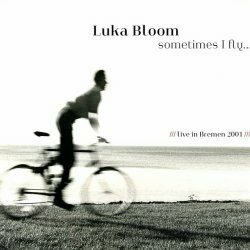 Luka Bloom's been doing it for 40 years now, but less than 40 seconds into "Sometimes I Fly …" he's doing it again: sending shivers and goose bumps up the back of your neck.